Musical notes can be organized according to the particular octave register they’re in, as we learned in last lesson. In this lesson we’re going to dive a little deeper into the concept of octave registers. As a review, octave registers are the special 12-note patterns that makes up the piano keyboard. In the previous lesson, we introduced a naming system for musical notes. The point of this system is so that we can tell a C in the lowest octave register (C1) apart from a C in the sixth octave register (C6), for example. Now we’re going to learn how to organize and visualize the various octave registers in our minds, and also find out what each of them sounds like. This is a big piece of the puzzle. Once we’re through with this lesson, we should have a much stronger grasp on how the piano keyboard, and musical notes in general, are organized. The huge sea of notes will be neatly divided into sections, and the intimidation of the 88 keys will start to slip away. Octave 2 is low sounding (not earth-shattering-ly low, but very low). Octave 6, on the other hand, is high (again, not ridiculously high, but very high nonetheless). This is a simple but very effective way to think about octave registers. Each note belongs to its own area that we can picture in our heads, and we can also get a sense of how high or low in pitch it will sound even before we actually hear it. On the low end, we have A0 and B0. Technically, they’re part of a new octave register, but practically, just think of them as an extension of Octave 1. A few extra notes never hurt anybody. At the upper end, the very last note is C8. Again, we can just think of it as one extra note added on to Octave 7. 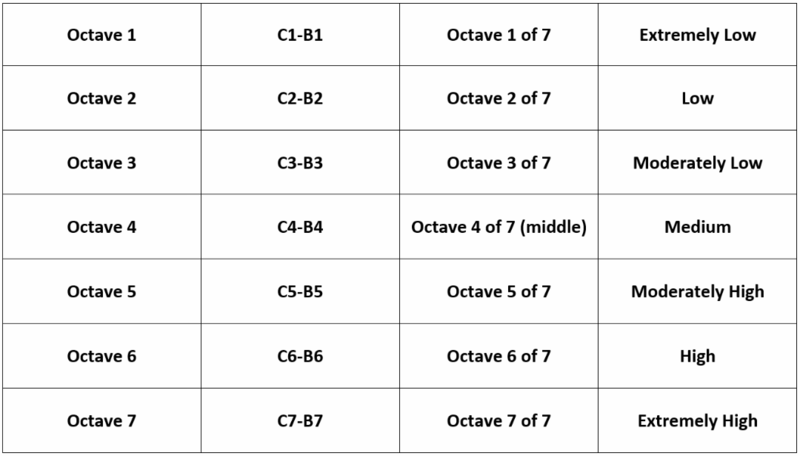 There are actually technical names for each octave register, such as contra, great, small, etc. But these aren’t used very commonly anymore, and that’s why we’re leaving these out completely. It’s easier to just remember the octave number, along with the description of pitch (medium, moderately high, etc,). If you do feel the desire to learn those traditional octave names, though, go right ahead! You can find a detailed description here. Okay, so that’s all wonderful if we have an 88 key grand piano sitting at home, but what if we have a keyboard that has fewer than 88 keys, such as 76, 61, 49, or even 25 (some of the standard keyboard sizes)? How do we identify the different registers on these smaller keyboards? Also, we’re obviously not getting the full range of notes, so exactly which octave registers are they giving us, and which ones are they leaving out? Well, the first step is to find middle C. Almost always, you can assume middle C will still be the closest to the middle of whatever keyboard you’re using. 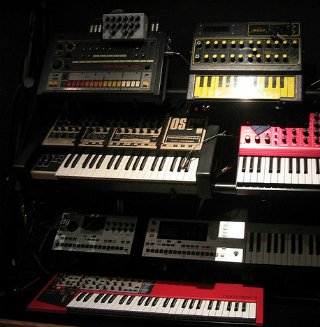 Since the lowest and highest octave registers are generally used a little less frequently than the middle ones, those are the ones they leave off of the smaller keyboards. The same logic will work for keyboards of other sizes like 76, 61, and 25 keys. Simply find the C closest to the middle, which will almost certainly be middle C, and then work your way outwards toward both ends of the keyboard to see how far up and how far down it goes. But what if we do want to play those really low or really high notes? Have no fear; we still can. For this purpose, there are usually ‘octave’ buttons on the keyboard that allow us to transpose the entire keyboard up or down by an octave. So for example, if you press the ‘Octave Down’ button on our 49-key synth from the previous example, the keyboard range will now be from Octave 1 through Octave 5; it’s as if the whole thing slid down an octave toward the left side of the piano. The opposite would occur if you hit the ‘Octave Up’ button. Many keyboards will let you transpose the keyboard several octaves in either direction, which would allow you, for instance, to play ultrasonic music that only small rodents can hear, to your heart’s content. Having octave buttons eliminates the need for a huge space-hogging keyboard with all 88 keys, yet we can still reach all of the keys when we need them. And without octave buttons, 25-key keyboards would be pretty useless! However, octave buttons won’t really work so well if you need to switch them right in the middle of a piece. Classical piano is challenging enough without the additional problem of having to press an octave button at exactly the right second to transpose the keyboard. One possible solution is to use a midi foot pedal that would allow us to switch octaves by pressing the pedal, allowing us to keep our hands on the keys. However, the best bet for classical piano enthusiasts is definitely to use an 88 key keyboard, or at the minimum 76. How many different notes are there in an octave register? Which note marks the beginning (left side) of each octave register? How many complete octave registers are there on a standard full-sized piano? Which octave register contains notes whose pitch can be described as medium? How would you best describe the pitch of the notes in Octave 6? What is the name of the A note that is located in Octave 2? What is the name of the last C note on a full-sized standard piano (all the way on the right side)? On a smaller keyboard, how does one access higher or lower notes that are not available on the keyboard?